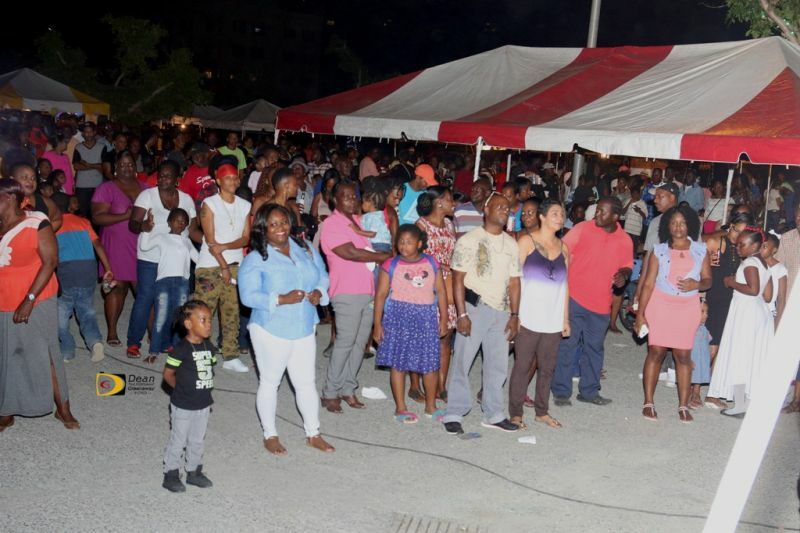 ROAD TOWN Tortola VI - The hands of vendors, especially food vendors, at the 19th edition of Christmas on deCastro Street were not enough to match the massive crowd that turned out on December 2, 2017, making the event a success in almost every way. "I am so pleased, I am very happy that our people came out. It was nothing but awesome, awesome," said an obviously elated City Manager Ms Janice E. L. Brathwaite-Edwards. She attributed the turnout to the participation of children which in turned resulted in their parents and, in most cases, their entire families being present. "We had gifts for everyone, both adults and kids. 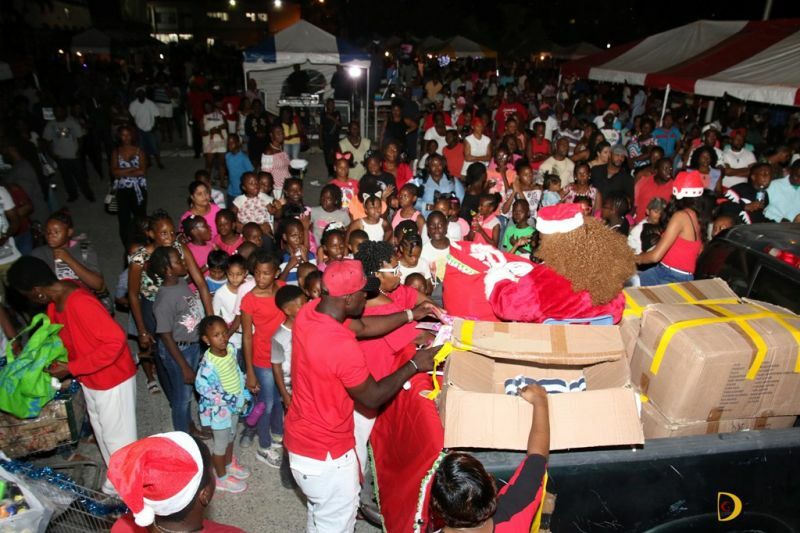 The kids got the goodies and the adults got food hampers and that also made a big difference this year," she added, while expressing gratitude to all donors, including a cruise line that donated 400 bath towels. Due to the overwhelming support, most of the stalls that sold food last night said they hadn't enough to satisfy the demands. "I was scared to make more because I know how things are right now here in the BVI and I thought people would be holding back on the spending but I was wrong. If I had brought out four times of what I prepared all would have been sold out here tonight. I hadn't enough hands tonight and I am happy because it really shows that we were hit down but not knocked out and I am very, very happy," said one vendor who became very emotional while speaking of the resiliency of residents. "I am very happy that they didn't decide not to keep this here this year because of the hurricane devastation. I didn't see as many stalls this year, maybe they were afraid of losing or maybe they just were not in a position to make the investment this year, but I am very happy it turned out to be a big success," said patron Kimmorvia Cline. "This was a well needed break for me and my family," said Roshele Penn. "I am still struggling in a small corner in our apartment with tarpaulin roof living in stress…a good friend came over and convinced me to come out and I don't regret I did. I feel so relaxed and relieved that I can go back home with renewed energy to deal with the struggles," she added. She also said she shared her dilemma with someone while at the event and they offered her an apartment at half the cost she is paying at present. "All I can say is God is good…the landlord said she don't want any advance and for the first 3 months I can pay at the end of the month instead of the beginning of the month, starting next week." On the other hand, some persons shared that there should be a “Christmas city” for at least one week. "Something like festival right here in the parking lot on deCastro Street and then close it off with what we had here for the two nights, just a thought," said a high school student who requested not to be named. It was a wonderful event. My kids loved it. Good turnout at the end. You could have something like the 12days of Christmas in the City climaxing with what happened last night. Just in support of the student suggestion.